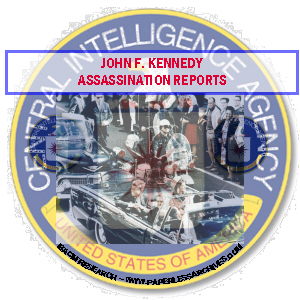 1,287 pages of CIA reports, produced mainly during the months after the assassination of President Kennedy on November 22, 1963, copied from material held at the National Archives and Records Administration. The files date from December 9, 1960 to October 20, 1964. Much of the material covers the time Lee Harvey Oswald spent in the Soviet Union and his visit to Mexico City two and half months before the death of President Kennedy. A CIA produced narrative chronology gives an annotated timeline account of the Oswalds in the Soviet Union from October 1959 to November 1962, based on personal documents, interviews and official and un-official correspondence. A report titled "Name List with Traces" contains the names of persons in the Soviet Union known to or mentioned by Lee Harvey Oswald and Marina Oswald. Entries include identifying information from name traces. A sworn affidavit by CIA Director John A. McCone that Lee Harvey Oswald was not an agent, employee, or informant of the Central Intelligence Agency. A translation of the transcript of an intercepted telephone conversation between Cuban President Dorticos and the Cuban Ambassador to Mexico, Joaquin Hernandez Armas, which took place on November 26, 1963. A February 17, 1964 report prepared for the Warren Commission entitled "Soviet Use of Assassination and Kidnapping." It sets forth information from a variety of sources on KGB employment of assassination and kidnapping techniques to eliminate enemies of the USSR abroad. A report by future Director of Central Intelligence, then Deputy Director for Plans, Richard Helms, about a 45 minute conversation between Drew Pearson and Soviet Chairman Nikita Khrushchev in Cairo on May 24, 1964, concerning the Kennedy assassination. A report generated to fulfill a request by Warren Commission General Counsel J. Lee Rankin on Soviet "brainwashing" techniques. The report is titled, "Soviet Research and Development in the Field of Direction and Control of Human Behavior." A report by Richard Helms to the Warren Commission about the CIA's approval and disapproval of the release of certain CIA documents provided to the Warren Commission. Includes suggestions for modifications and replacement of certain reports before they are published by the Warren Commission. Reports analyzing world reaction to the assassination of President Kennedy, especially in the Soviet Union and Cuba. Detailed reports on the background of Marina Oswald and her relatives, her life in the Soviet Union is examined in several reports. Apparent Inconsistencies in Material Furnished the Commission by CIA and the Department of State.